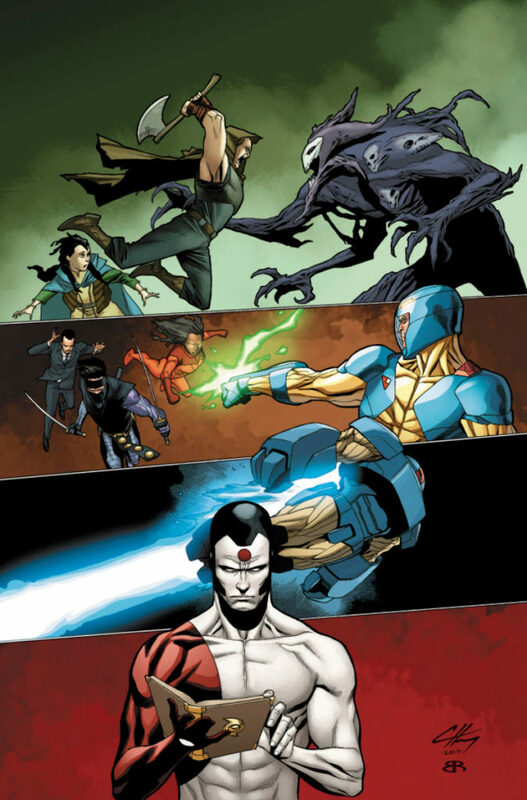 Behold… The History of the Valiant Universe! Valiant is proud to announce RAI: THE HISTORY OF THE VALIANT UNIVERSE #1 – an astonishing standalone tale revealing the saga behind Valiant’s greatest heroes and villains from prehistory to the 41st century! On June 14th, traverse the long and storied history behind the rise of Earth’s most formidable heroes with multiple Harvey Award nominee Rafer Roberts (Harbinger Renegade) and acclaimed artist Francis Portela (Faith) as they present a stunning overview of Valiant’s centuries-spanning universe. Inspired by the original, legendary RAI #0, this self-contained one-shot special is the ultimate introduction to the historic moments that will forever define the Valiant Universe…past, present, and future! Rai, the spirit guardian of Earth, has uncovered an ancient tome filled with history’s greatest tales and civilization’s darkest moments. 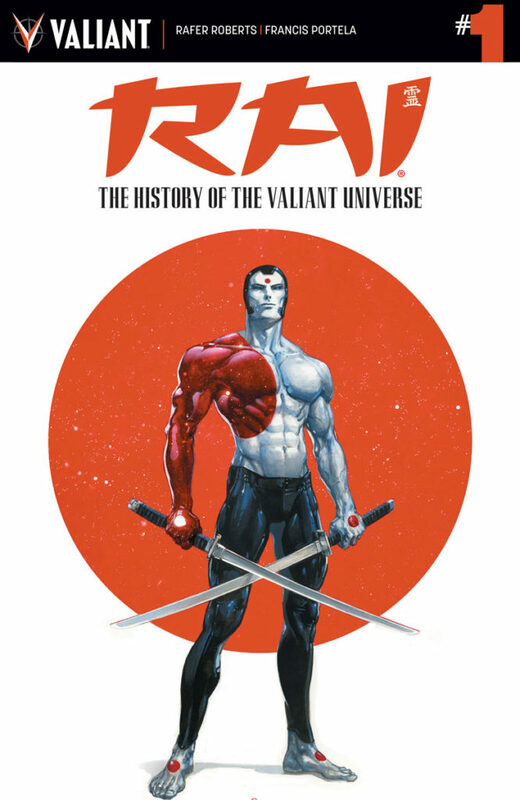 Charting the dawning days of ancient Mesopotamia all the way to the rise of New Japan, the history of the Valiant Universe is laid bare in shocking and revelatory detail. From X-O Manowar to Bloodshot to Faith to Divinity…history will reveal untold revelations for Valiant’s greatest heroes and antagonists! On June 14th, all-star creators Rafer Roberts and Francis Portela salute 25 years of New Japan’s homegrown guardian and introduce a jam-packed jumping-on point for the largest independent superhero universe in comics with RAI: THE HISTORY OF THE VALIANT UNIVERSE #1 – featuring covers by Clayton Crain (4001 A.D.), Clayton Henry (Harbinger Wars), Robert Gill (Book of Death), and Jeffrey Veregge (Red Wolf)! Plus: On April 12th, the anniversary celebration of Valiant’s most celebrated heroes begins with a swashbuckling adventure from New York Times best-selling writer Fred Van Lente (Archer & Armstrong) and Eisner Award winning artist Cary Nord (X-O Manowar) in IMMORTAL BROTHERS: THE TALE OF THE GREEN KNIGHT #1 – a special 48-page quest into Arthurian legend with Archer & Armstrong, the Eternal Warrior, and Ivar, Timewalker! Then, on May 10th, take up arms alongside New York Times best-selling writer Robert Venditti (Hal Jordan & The Green Lantern Corps.) and acclaimed artist Renato Guedes (Bloodshot Reborn, Wolverine) as they unleash ETERNAL WARRIOR: AWAKENING #1 – the second of four special issues honoring the most beloved Valiant stories ever told with a special standalone tale torn from Gilad Anni-Padda’s long march through the ages. $3.99 | 32 pgs. | T+ | ONE-SHOT | COMING IN JUNE!